Diffuse the situation. Aromatherapy for well-being. Breathe in relief. 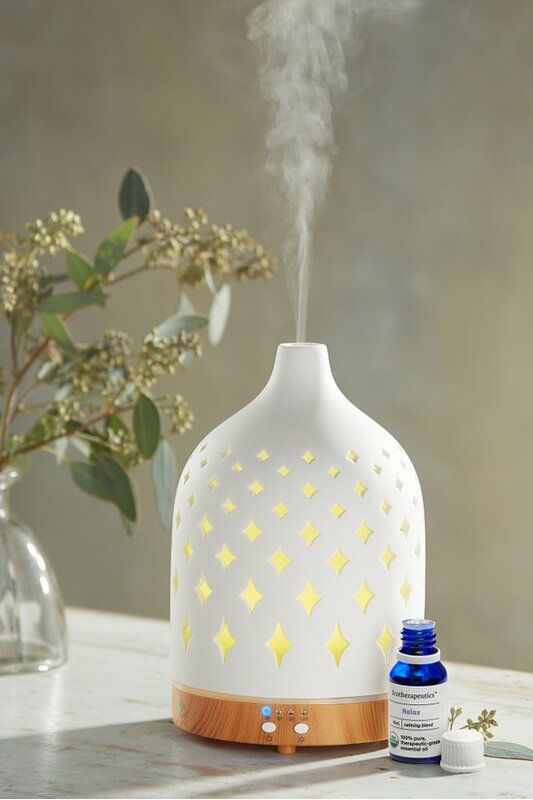 This room diffuser and humidifier uses ultrasonic vibrations and cool mist to fill your space with the natural healing benefits of aromatherapeutic essential oils. Place in your room to promote better sleep or ease a migraine, muscle aches, stress and more. Remove ceramic cover. Remove water container lid and fill with natural and clean water (not steam distilled water). Add a few drops of your choice of essential oils to the water. Place water container lid and ceramic cover back on the unit and push start. Select your timer option and color option. Clean after each use. Do not let water get inside the unit. Ceramic cover is breakable, handle with care. Improve your sense of well-being through healing aromatherapy. Serene House brings nature into your home with their collection of beautiful, personal air care diffusers that fill your home and your mind with fresh, healthy air and a feeling of joyful contentment. Just a few drops in the aromatherapeutic diffuser eases stress, encourages a restful night's sleep or energizes your soul.